When moving, deciding what to keep and what to leave behind is a crucial, yet bittersweet, job. In today’s buyers’ market, leaving behind a prized possession may score you a sale. Likewise, arguing to keep the item may lose you a sale. When it comes down to it, is finding a buyer more important than keeping your beloved belonging? Household items that could stay or go often produce bickering between buyers and sellers, more often than you think. Take your dining room chandelier, for example. If you spend a hefty amount of your savings on it, it’s relatively new, or you bought it on a vacation or at a special event, you don’t want to part with it. It would look just as lovely over your new dining room table. But say the buyer sees the chandelier in the photos, falls in love with it, and assumes it’s staying. What now? Before your house goes on the market, take the time to consider what items have significant value to you. Will you take or leave behind light fixtures, drapes and curtains, blinds, furnishings, shelving units, washer/dryer sets, kitchen appliances and plants? 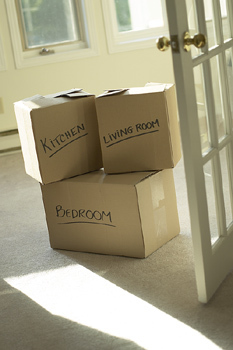 With smaller items, store them away before buyers view your house. If you want to keep your living room drapes, for example, take them down before the photos and open houses begin. If it’s a larger item, like your refrigerator, make sure to emphasize that it is not included. This will help diminish buyer confusion later in the selling process. Deeply consider if it’s worth the hassle of transporting this item to a new home! Take landscaping, for example. You are head over heels for that azalea in the backyard. It’s relatively young and you want it planted in your new yard. First off, you have to remove the foliage before you put your house on the market; otherwise it’s considered a permanent attachment. Second, you must check your HOA restrictions to see if removing landscaping is allowed. Third, consider how long the plant will be out of the ground and if it’s probable that it will live through the move. Sometimes, it’s just not worth the hassle to keep a prized possession. If you have already chosen a new home, consider the layout, theme and design of this home. If you’re downsizing, will there be room for the item? If you’re upsizing, is it worth potentially losing a buyer’s offer? Does your new home already come equipped with blinds, light fixtures or a washer/dryer set? We all experience a profound attachment to a certain possession. When it comes down to keeping or leaving it behind, the quickest way to decide is to ask yourself, how much will you miss the item a year from now?